The curtains are finished, folded and in the box with a few other things to be taken to Virginia. I'm feeling crafty again. I'm sure it's because it's fall and I just love these days. There's also the knowlege that there are less than 100 days to Christmas and I have all these gift ideas. I finished a project I can't reveal, at the present time. That set me on a course for the next project. 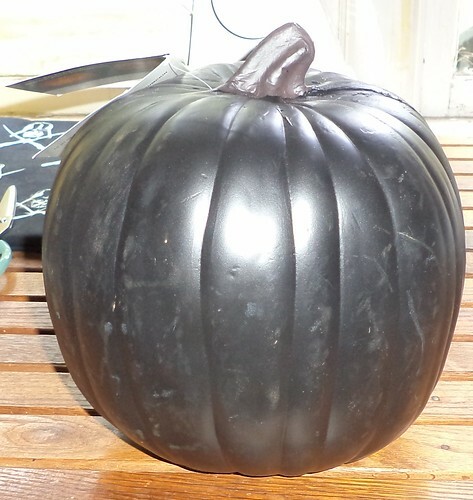 It involves a black pumpkin. I got mine at JoAnn Fabrics. They are kind of expensive, I think, if you buy them at regular price. But when they are 60% off AND you have a coupon, they are a very good value. What this becomes will be the subject of a post over the weekend, assuming I'm not worn out from being in the city Wednesday through Friday. It's a multi-step process anyway. Got to let the glue dry, you know. I will be sewing for Christmas. I'm a sucker for Iowa Hawkeyes fleece. 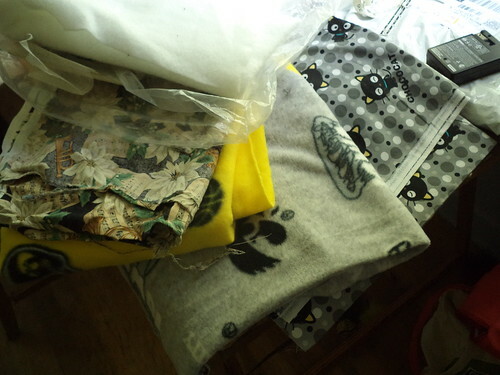 There was this grand idea that I would make myself a fleece patched lap blanket out of all the pieces I had accumulated. Yeah...not gonna happen. Even though I have large enough hunks that I could do that, I would look at the fabric and think, "What was I thinking?" But then it hit me. I have grand nieces and nephews. I should make them something Iowa Hawkeye. See how much of this I have? I have 5 kids under the age of 8, who could get something out of these 3 pieces of fabric. In the same trip where I bought the pumpkin, I bought patterns and buttons. Everything else I had. The cat material above is going to become a tote bag with copious amounts of pockets. I'm tired of not being able to find exactly what I want in a bag. So, I'm going to make what I want. I will need to buy interfacing for that because I don't have enough of the very stiff kind, but that's low on the priority list right now. The floral to the left is something Carole picked out years ago. It's finally going to be turned into its intended purpose. Last year was the year of crocheting. This year is the year of sewing. It can take me a bit to get started but once I do, the momentum of completion fuels the next project. I can't wait to see the finished pumpkin!